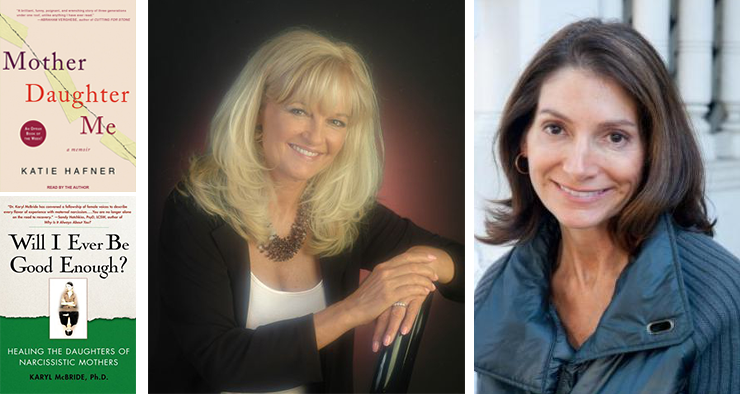 Katie Hafner, author of her memoir, Mother Daughter Me and reporter for The New York Times interviewed Dr. Karyl McBride about her pioneering work on maternal narcissism titled: Will I Ever Be Good Enough? Healing the Daughters of Narcissistic Mothers. Katie Hafner: You write very early in your book that many factors other than mothers shape a child’s life. How does one distinguish between those other factors and those that can be attributed to a mother in shaping a daughter’s psychological makeup? Dr. McBride: This is interesting because I did not want to believe myself that mothers had such power, but I now believe they do. A mother, is her daughter’s primary role model for developing as an individual, lover, wife, mother and friend. Children learn more from what they see modeled for them and how they are treated than what is preached to them. If early bonding and attachment is not secure, we can assume the child will have repercussions from this lack for the rest of their lives. Thank goodness there are other factors that shape us too and it is difficult to sort each out, but I think the most important is to remember the power of a mother’s validation. One thing I found in my research was the importance for a child who did not have a nurturing parent, was when they had another role model such as a grandmother, aunt, father, teacher, or the like. Katie Hafner: You write that your own mother understood you were writing a book “about healing, not about blame.” Do you think it takes a very compassionate, non-narcissistic mother to fully support such an undertaking? Dr. McBride: I really don’t want to answer this question because things changed, when the book was actually published. In the true sense of not believing in the child, I think my parents did not believe the book would actually get published, so they were able to talk about it with me. They were even able to give examples from their childhood. But, when the book came out, the story changed. I still love and credit my parents for many things, but I can’t say they supported the book in the end. I actually agonized for four years while writing this book about whether or not to write from a clinical or personal perspective or both. I had to do both. It was a hard decision though and I am still suffering the consequences of course. But, in the end, the way it was written has helped many women and men and there was a bigger mission to accomplish here that was a calling I felt I was called to do. Standing in my truth has taken courage and I now encourage others to do the same. It is truly how we heal. Katie Hafner: You mention how difficult it is to break the cycle of intergenerational trauma, of passing one’s own flaws and foibles, weaknesses and destructive behavior, down to your own children. My guess is that it isn’t a cycle that can be broken all at once, that it takes time, and the passing of several generations, for destructive patterns to die out completely. Do you agree? Dr. McBride: I am a true believer in stopping the legacy of distorted love. I think much can be done in one generation if people take the recovery work seriously. It really is internal work and hard work. But in the end, it makes a huge difference. Do we unwittingly pass some of it down? Yes, and we have to forgive ourselves and keep trying. Keep communicating with our own children. Keep working recovery. Keep ourselves open to discussion with our children always. It is ok to talk about problems and feelings. It is ok not to be perfect in parenting. We can all keep growing and learning. My work is about love and healing not about blame. Katie Hafner: You write that a narcissistic mother “never approves of a daughter simply for being herself.” Why do you think that is? Dr. McBride: A narcissistic parent tends to see the children as an extension of themselves. Narcissists do not like themselves much and have very fragile egos. They project onto their children their bad feelings and their self-loathing. They cannot experience empathy and therefore do not see their children in their own right. It is more about how the child is making them look as a parent. It is extremely sad and emotionally abusive. The child picks this up very early, but can’t label it or understand it, so they spend their childhood trying to please the parent, rather than working on their own precious development. When they fail to please the parent, they understandably think it is their own fault. They are flunking childhood. There is something wrong with them. They are somehow not good enough. Katie Hafner: You write about healthy separation of a daughter from her mother versus the inability to separate emotionally. What do you believe is at the root of that inability, and what are the consequences? Dr. McBride: I identify narcissistic mothers as either engulfing or ignoring. And sometimes they do both, how confusing is that? If you had an engulfing mother, she is telling you how to act, how to talk, how to dress, how to feel, etc…and she is not encouraging you to be yourself. If you have an ignoring mother, you are constantly trying to get her love, approval, attention and not working on being yourself. This lost time in development is crucial. Separation-individuation is an important part of development and should start in early adolescence. Most adult children of narcissistic parents don’t get to do this until much later in life when they work recovery. That is why step two of my five step model is on separation-individuation. Katie Hafner: Your book makes me wonder about the extent to which daughters of mothers with narcissistic tendencies are enablers. I have one specific example from my own life. When I was a correspondent for Newsweek, living in the San Francisco Bay Area, I was sent to San Diego, where my mother lived, to report a story, and instead of staying in a hotel, I stayed with my mother. I tried to work from there but instead was case in the role of visitor and admirer of her dogs. I ended up doing precious little reporting. Yet I had only myself to blame for not drawing clearer boundaries. (The inability to draw clear boundaries remained a persistent problem for many years.) What do you think of this question of enabling? Dr. McBride: I don’t call this enabling. I think this is the true wish and desire to have a loving connection with the mother. We all want, need and deserve that. It is very common for adult children to keep trying to get this connection to no avail. When we realize it is not going to happen, and accept who the parent really is and that there is a disorder that we can’t fix, is when recovery really starts. Step one is about acceptance of this and it is so important. We really can’t do the grief work without this acceptance. We keep going back to the empty well, hoping and wishing. We do learn to set boundaries but that is Step Four. Boundary setting is hard until we work the first three steps. I believe the recovery steps need to be worked in sequence or they are not effective. Katie Hafner: I truly believe that my mother loved both her daughters, but was ill equipped to care for and nurture them properly. Moreover, I spent years thinking that if only alcohol hadn’t been part of the picture, my mother would have been a nurturing mother. Do you think that substance abuse can cloud, or mask, a mother’s true nature, and make her seem more narcissistic than she actually is? Dr. McBride: In Will I Ever Be Good Enough? I identify six faces of maternal narcissism: the flamboyant-extrovert, the accomplishment oriented, the psychosomatic, the addicted, the secretly mean, and the emotionally needy. All of these types of maternal narcissism I have seen in my practice and research. Some N mothers are a combination of these. The addicted is particularly painful. Addicts when using are always displaying narcissistic traits as their addiction comes before everything else. Sometimes when the addict sobers up, the narcissistic traits seem to go away and many times not. It depends on the person. But the cornerstone of maternal narcissism is lack of empathy and the inability to tune into the child’s emotional world. The addicted is clearly about themselves and their own needs. Katie Hafner: Speaking of nurturing, when I was little, I harbored a fantasy about my mother wearing an apron and greeting my sister and me after school every day with a plate of chocolate chip cookies. It wasn’t until I started writing Mother Daughter Me that I found that many children held onto that very same fantasy – complete with apron and cookies. What is it about that particular image that made children of my generation (raised in the 1960s) yearn so universally for something so specific? Dr. McBride: I do think before the feminist movement, many mothers were stay at home mothers and this is what was portrayed as well on television in shows such as Leave it To Beaver, and Father Knows Best. They portrayed the idealized or idyllic family scenes for all to follow. Add the pearls to that apron scene in the kitchen! When latch key kids and day cares became more prominent, this scenario at the door with milk and cookies kind of went out the window. But, it is really not the test of mothering as we all know. The real test is tuning into children’s emotional world, hearing them, validating their personhood, feelings, and life experience, and guiding and teaching them about life with lots of nurturing. We now know this can be done by both stay at home and working mothers. It’s not really about the cookies of course. It is interesting though what you say…my daughter always had this same fantasy and still talks about it. I also remember the coloring books when I was raising my children. The boys were out sledding and skiing and building forts and the girls were portrayed in aprons in the kitchen baking with Mom or petting kittens. Remember that? I did not buy those for my kids. I bought something called the Un-Coloring Books. They were great for large motor skills and did not have the sexist pictures. But funny enough, my son did not learn to color in the lines! OMG how horrible, right? I don’t think he has ever needed that skill in his adult life though. Katie Hafner: You write that motherhood is “an unassailable institution. A mother is commonly envisioned as giving herself fully to her children,” and our culture continues to expect this of mothers. When I read that, it made me wonder, well, why? It seems to place unreasonable expectations on women, particularly in this day and age. Further, it seems to set up any women who don’t do this as having narcissistic traits. Dr. McBride: This is tricky. I agree that the expectations of mothers are very great and unrealistic at times, but what we are talking about here is that it is important that mothers know how to love properly so they can raise healthy children who can love themselves and others. It is a huge taboo to talk about mothers in a negative way in this culture. It is an unassailable institution, think of Mother’s Day! But, unfortunately not all mothers learned to love properly and if this happened, then the children will have recovery work to do. I am a believer that women and men can parent well and also have their own visions and passions in life. I don’t think it is one or the other. But, it all takes work! When you do hard things, they’re hard! That’s a reality I think. Katie Hafner: In one of the sets of questions you pose to the reader, I was struck by one in particular: “Do you feel your mother knows the real you?” I had to answer that with an unequivocal “no.” Do you find that many daughters tell you that they do not believe their mother knows who they really are? Dr. McBride: Yes, almost every adult child of narcissistic parents that I have talked to or treated says this. How sad. But the narcissist is truly about themselves and not tuned into the child and this is why. It is also a desire that we all have. We want the people who love us to know us or it does not feel like love. What are they loving? What they want us to be?